Just a fun question I made up. Last edited by aa180; 13 Sep 2018 at 9:45 PM. a) Consider the graph of on the cartesian plane, for real . We will prove that both values of are either all positive or all negative. Since , both possible values of are positive for positive , and negative for negative . Suppose . Then the intercept is negative, and the gradient at that point is positive. Because all turning points of are for positive , is negative definite for and thus must have only positive roots. Now suppose . Then the intercept is positive, and the gradient at that point is positive. Because all turning points of are for negative , is positive definite for and thus must have only negative roots. b) Expanding gives the required answer. c) Expanding the RHS and simplifying gives the required answer. Then by replacing each variable with its cube root, we get the desired identity. e) Let the three (real) roots be . Now, taking the sum of roots two at a time gives . From a) we know that is required. If all three roots are real then both and are required, i.e. . It follows that if , then not all of three roots could be real (the contrapositive). Because has real coefficients, the complex conjugate root theorem applies - any non-real roots must come in pairs. And by the fundamental theorem of algebra, has exactly three roots. Therefore if not all of the three roots of are real, then it has exactly one real root. Last edited by fan96; 14 Sep 2018 at 2:06 AM. You only addressed the first two of these cases, and then stated that from which you concluded what you were trying to prove. I just don't see how it follows from that, without proving cases 3 and 4 directly as you did with 1 & 2. Last edited by aa180; 14 Sep 2018 at 3:12 PM. I didn't address those because they seemed trivial to me - my bad. If is positive, then must be positive since two positive numbers are being added. If is negative, then must be negative too since a positive number is being subtracted from a negative number. Another way to think about it is that if for positive then it follows that i.e. the magnitude of is always greater than the magnitude of . Therefore, adding or subtracting can never change the sign of . Last edited by fan96; 14 Sep 2018 at 3:30 PM. Lol, I didn't even see that - yes, they are trivial..whoops. You can also do part (a) by contradiction if you wanted to. Yep, you can also use that same line of reasoning for the proof by contradiction approach. I'm having some trouble with part (h). If one of the non-real roots had real part , then by the complex conjugate root theorem, the sum of the two non-real roots should be . Then, using the sum of roots, the last root should be . But is the point of inflection of . So therefore the point of inflection lies on a root, meaning that should have a triple root at , which contradicts the question. To double-check, I substituted into and put it into Wolfram Alpha to check the roots. The non-real roots did not have real part . Have I made a mistake with this reasoning? You are actually correct. 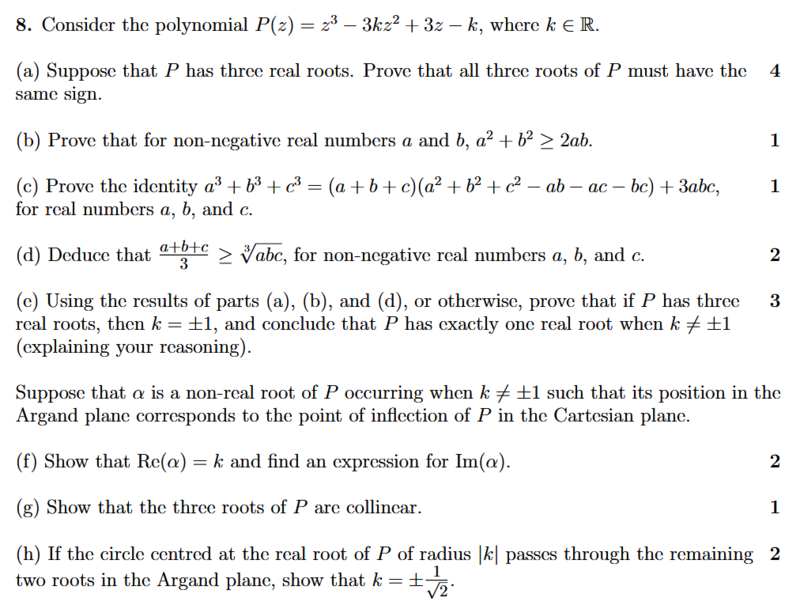 I just remembered that a while ago when I was trying to come up with polynomials questions, I tried to set one up that had a monic cubic equation with the remaining coefficients being all arbitrary, such that the cubic had a non-real root corresponding to its point of inflection in the real plane, and I derived pretty much the same contradiction you found - that the point of inflection of the cubic will forcibly coincide with the real root of the polynomial, which then gives three real roots instead of one. I must've completely forgotten about this when I was busy writing this question. I tried to amend (i.e change) the question so that the non-real root of P now corresponds to the point of inflection reflected about the y-axis, then tried to suppose that the centre of the circle through the three roots of P is the origin, but it turns out that that's also impossible lol. Seems like you can't get any nice geometric properties out of playing with roots of polynomial equations. I'll try to find some sort of way to reconcile this issue and will to get back to you shortly. Last edited by aa180; 14 Sep 2018 at 10:27 PM. Okay so I just realized I made yet another mistake and my amendment actually is possible, but you end up getting which isn't very 'nice-looking' so I think I'll still try to change it further. Last edited by aa180; 14 Sep 2018 at 10:53 PM. If k=1, z^3-3z^2+3z-1=(z-1)^3, if k=-1, z^3+3z^2+3z+1=(z+1)^3, . : exactly one real root each. I think you need to review your question. Are those not triple roots? Exactly one real root and no complex roots when k=+/-1. For other real values of k, there are 3 roots according to the Fundamental Theorem of Algebra, one must be real according to the Conjugate Roots Theorem. There's one real root of multiplicity 3 when , i.e there are three real roots - they just all happen to have the same value. There is only one real x such that P(x)=0. Not three real xs. Meaning of root. Suppose that is a non-real root of occurring when such that its position in the Argand plane corresponds to the midpoint between the origin and the point of inflection of in the Cartesian plane. (f) Show that and find an expression for . Last edited by aa180; 15 Sep 2018 at 10:01 PM. I tried k=sqrt(3.5), plotted x and y intercepts and alpha, they are not collinear. Also, I noticed that when you find the third (real) root using sum of roots and then sub these three roots into the product of roots, you seem to get an equation with certain solutions for that contradict the question. Yeah I just tried that and you're right. I think that means it's impossible to have an imaginary root that lies halfway between the origin and the point of inflection. I'll try a few other ideas and see where it gets me..
Well since there are still solutions that exist then there should be at least one complex number that works.